Backshot of a Young Caucasian Shorthaired Man, Wearing a Jeans Coat Walking in the Rain Under an Umbrella. He's Walking at Night in the City. Man musician playing the piano. He's wearing a plaid shirt, glasses, a gold watch, rings. Gray hair. 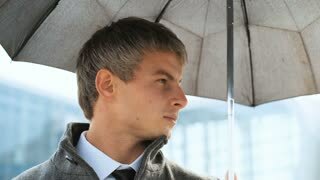 Serious businessman wearing suit and coat, looking at camera under black umbrella during rain. Portrait of man under black umbrella during rain. Serious businessman wearing suit and coat, looking at camera. Close up portrait of man under black umbrella during rain. Serious businessman wearing suit and coat, looking at camera.